Terrain Vague is our third micro residency, and this edition is run in partnership with the So Festival. Terrain Vague focuses on learning how we can regenerate a place by exploring its leftovers and its use of public spaces. Artists are called to map, re-imagine and influence Skegness. Moreover the residency aims to examine the way in which we transform our surroundings to reflect and enact the utopia of our dreams. Through the support of visiting artists, participants will investigate the meaning of contemporary ‘utopia’, as an element which can provoke the social imagination by resonating with the themes of hope and desire. This residency will critically play with ideas and practices of city planning, regeneration and ‘place-making’ and will investigate this specific type of space and imagery, becoming a tool of visual interpretation . Terrain Vague is programmed and curated by visual artist and curator, Chiara Dellerba. Her practice consists of researching and experimenting different situations, where she shares and rediscovers with other people: personal memories, traditions, rituals and cultures to address questions about radical aesthetics, self sufficiency, the magic relation human-Nature, the politics of food (production methods and sharing experiences), personal and public manifesto and its value in the contemporary society. Charlotte Cullen is an artist and researcher. Creating complex and emotionally responsive environments Cullen incorporates sculpture, installation, text and performance. Material enquiry traverses the embodied, material nature of social class, desire and disadvantage. Sculptures integrate scavenged and cheap materials creating environments of fractured space which extricate trauma and the body, social class and familiar bonds. Cullen was awarded a Vice Chancellors Studentship to undertake a Practice-led PhD with the Centre for Sculptural Thinking at the University of Huddersfield, completed in 2018. Cullen recently completed an ACE public art commission for Yorkshire Year of the Textiles at the Royal Pump Room, Harrogate and in 2016 was selected for UK Young Artists. Chlamydia the Band - Emily Dunlop and Camille Biddell originated from a performance art collective called Chlamydia, set up at Edinburgh College of Art. They started the band out of curiosity and out of their love of working collaboratively. As the band developed, they became aware of its command of an audience that disrupted the usually impenetrable atmosphere of an art exhibition. In November 2018, Chlamydia the Band was invited to perform by Turner-prize nominee artist Monster Chetwynd at her exhibition in Turin. The band played alongside puppeteers and performers in her large- scale, multi-media installation. This experience gave them the drive for the kind of work they want to make, and the energy and humour that their art can bring to the table, so opposite to the uptight atmosphere of many contemporary art events. Hollie Miller is a visual artist working with performance in live and recorded contexts. In her work she uses her own body as a vessel of transgression and subversion in search of truths. She was recently artist in residence at the Serlachius Museum in Finland and NAIRS Contemporary Art Centre in Switzerland. She has upcoming performance installations at Airspace Gallery in Stoke-on-Trent in April and UCA in Farnham in May; in November she will be artist in residence at Hogchester Arts in Dorset for a future exhibition. Hollie studied Dance and Somatic Practice at The Northern School of Contemporary Dance and Performance at The Royal College of Art. 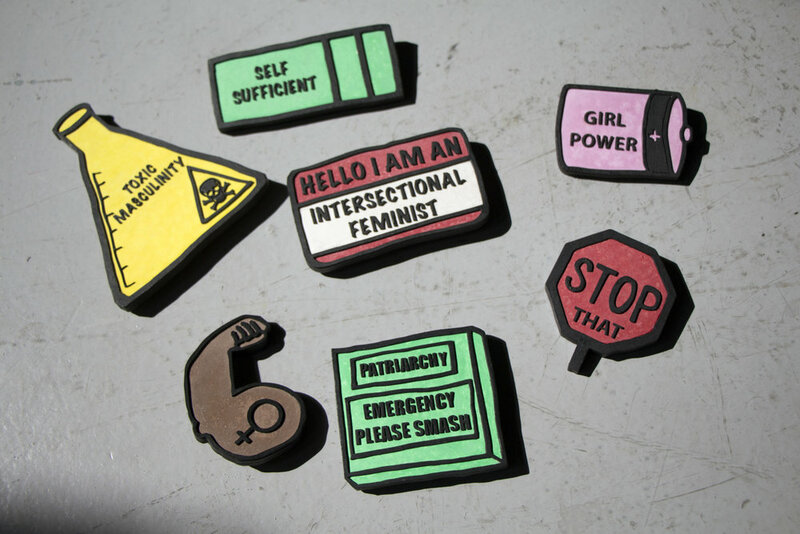 Jasmine’s work centres around social issues, more recently around Feminism. Jasmine is a mixed media artist specialising in jewellery, she uses illustration to create handmade pin badges. Since winning the New Designers UKYA Award and exhibiting her work during the Nottingham City Takeover, Jasmine has developed a stronger drive to focus the subject of my work on my home, which happens to be Skegness. Over the next year she will be focusing more on her solo work, but she is also in the early stages of a collaborative project with her friend Hannah Finnegan who is also from Skegness. “Pretty Grim” will be a zine which highlights the positive and negative aspects of living in a deprived area and what it is like to live/grow up there as a creative, looking at how the arts could help improve the area. Kyle’s work stems essentially from the world we live in and taking elements of observations and experiences of society and his interactions, or lack of, with it. The inter-twining links of human nature. Kyle likes to explore what our conceptions are of our world and why we have them. What stereotypes and stigmas one places on oneself but also those placed on us by each other, and the act of playing towards them or pushing them away. Kyle prefers cross-platform work, using physicality, spoken word and music as a base, as he prefers the audience to walk away having experienced something, as opposed to merely viewing/watching. Looking ahead Kyle is interested in pursuing a cross-platform project on the concept of being a Mixed Race person in the UK today, with the potential to explore a written publication further down the line. Lorena is a young artist, sculptor and illustrator based in London. Her work references ideas based on trace, the recycling of materials and links between person and place through various methods such as paper making and collage. 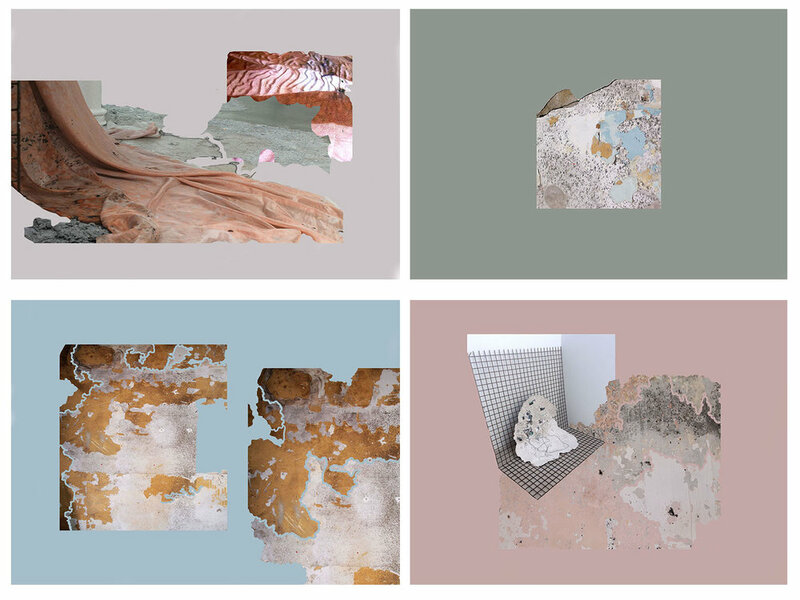 After graduating with a degree in Sculpture at Camberwell College of Arts she began working at an interior design and architecture studio where she takes inspiration from the vast collection of materials on display and beautifully detailed sketches. Lorena is currently working on a series of sketches, prints and a poetry publication. Her previous projects include collaborative projects, murals and large scale pieces of handmade paper, metal grids and digitally printed silk as subtle interventions in space. As a practitioner, Mimi cultivates socially-engaged dialogue about identity, culture and class through performance and immersive installation; prompting questioning and reflection on the contemporary experience. Mimi is currently studying her last year of Interactive Arts at Manchester School of Art, and, following recent material experimentation’s with concrete and inflatable objects, has been working on building a 4m diameter inflatable geodesic dome space, facilitating workshops, talks, happenings and performances over the coming months. In addition to her practice, Mimi runs the artist collective and community organisation Get It Done, who’ve been bringing creative and cultural events to Manchester since 2017. As an organisation, their main concerns are widening accessibility to the arts, providing platforms for young people, encouraging creativity and working with overlooked communities. Ryan is an emerging Visual Artist, Designer, and Illustrator operating in the Midlands. After graduating with a degree in Architecture and Built Environment, Ryan started his own art practice producing several small exhibitions and installations across the Midlands. Ryan’s work reflects on his disengagement with contemporary culture and the built environment. He finds pulling objects, thoughts, emotions, and symbols out of their respective contexts allow him to explore their creative possibilities. In his artworks he draws attention to the forgotten, overlooked, ignored, or benign in the hope viewers will be forced to interact with the subject. Ryan’s work is grounded in traditional media; however, he experiments combining these with digital practices.